Every New Years, when its time to make resolutions, I resolve to drink more. Because I barely drink. And I feel like I should imbibe more. I feel like it would make me more social, and our vacations better. We were on a trip to Prague and they had an ice bar there. A bar where everything is ice! And they give you heavy jackets to wear and you take lots of pictures of yourself to show how fun and cool (literally and physically) you are. And we didn’t go to it. That’s right. How often do you get a chance to do something like that (assuming you aren’t a Miami Level Trophy Wife who flies around the world regularly)? And we had the chance, and passed. And the reason we passed was seriously lame – when we were near the ice bar it was mid-afternoon and we didn’t want to have a drink so early. And we didn’t want to make the effort to come back later at night. Tonight, though, I think I finally fulfilled my resolution. I drank a coke with cherry vodka. By myself. While I made dinner. It probably actually holds to much, as I am still really not a drinker and I sip so slowly that the ice melts and dilutes my drink so much that I end up throwing a lot of the drink out. But at least I actually make the drink now! The cherry coke didn’t really go with the Pork and Spinach dish I made, but I didn’t let that stop me. I enjoyed both of them thoroughly. 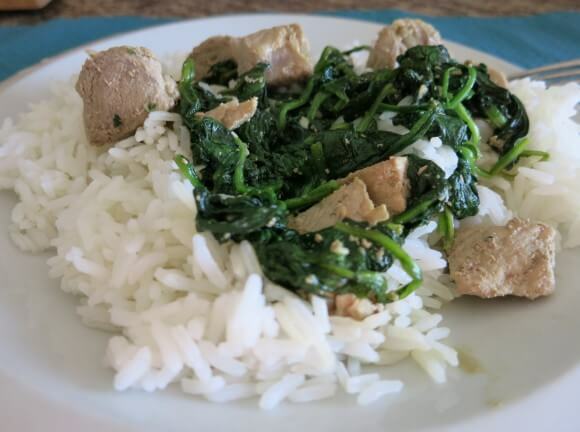 Especially since the Pork and Spinach dish is really easy, and only requires one pan and minimal ingredients (I’m thinking of you Hannah and Freedom). The soy sauce and lime make it very flavorful, but still light. And as we know, I love a dish that allows you to throw the veggies right into it. Added bonus of being pretty healthy. Serve it over rice, with the drink of your choice, and you have a great meal. Place wok over medium heat. When wok is hot, add 1 tbsp of the sesame oil. Add all the pork, and cook until no longer pink. Remove pork from pan, and keep warm. Add remaining tablespoon of oil. Add garlic and cook for 2-3 minutes, until browned. Add spinach, stirring until wilted. 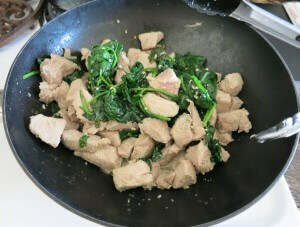 Return pork to wok, add soy sauce and lime juice. Cook for 2-3 minutes until pork is warm. * The original recipe called for peanut oil, but I was out so I used sesame oil instead. ** Spinach seriously wilts down. A bag seems like so much when you first add it, and then it becomes half a cup once wilted. So if you really like spinach, or want to ensure lots of healthy, have an extra bag on hand, just in case.